Welcome to the British Hen Welfare Trust Media Centre. If you would like further information or to set up an interview with the Founder, Jane Howorth , please email Francesca Taffs at francesca.taffs@BHWT.co.uk and we will be pleased to help. Who is the British Hen Welfare Trust? The British Hen Welfare Trust is, national charity that re-homes commercial laying hens, educates the public about how they can make a difference to hen welfare, and encourages support for the British egg industry. Its ultimate aim is to see consumers and food manufacturers buying only UK produced free-range eggs, resulting in a strong British egg industry where all commercial laying hens enjoy a good quality life. What does the British Hen Welfare Trust do? The charity re-homes commercial laying hens destined for slaughter and re-homes them predominantly as family pets. This pioneering initiative is hugely popular with the public and tens of thousands of hens are given the chance to enjoy a free range retirement each year. 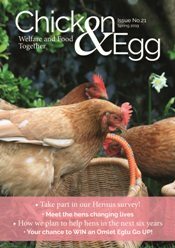 The British Hen Welfare Trust uses a positive campaign strategy designed to educate the public and make them aware of their capability to make a difference to hen welfare through their shopping basket. 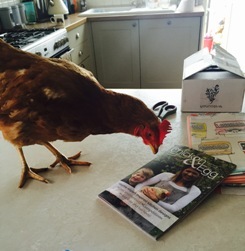 We have a large supporter base and regularly keep in touch by supplying our ‘Fresh Laid News’ email and Chicken & Egg magazine. The statistics below show the growth in popularity of the British Hen Welfare Trust’s re-homing initiative. There are still approximately 16 million colony caged hens in the UK. As a result of our pioneering work increasing numbers of consumers now want high welfare as well as high quality. Our positive impact has seen free range production grow into one of the most successful sectors of British agriculture and nearly half of all British laying hens have access outdoors. The barren battery cage was banned in January 2012. The British Hen Welfare Trust’s ultimate aim is to see all commercial laying hens enjoy a good quality free range life, but the charity is staunch in its support for the UK egg industry and as long as there is demand for caged eggs would rather see enriched caged egg production in the UK rather than imported caged eggs from countries where welfare is beyond our control. Nearly 60% of caged eggs end up ‘hidden’ in processed food products, such as cakes, pasta, confectionery and ready meals. Caged eggs are also frequently ‘hidden’ in meals served at restaurants and other eating establishments.